GOLDEN AGE ADVENTURES is an anthology of 16 roleplaying adventures based on "Golden Age" stories by famous science fiction writers of the 1930s-50s. Each adventure comes with three scenarios, allowing them to be easily dropped in to any science fiction roleplaying campaign. As with all DayTrippers products, conversion tables are provided for use with other game systems. 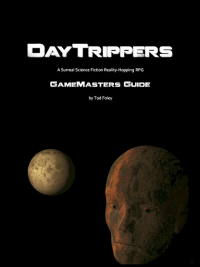 Also provided are new rules and GM guidelines for Hexcrawls, Random Encounters, Optional Content, Mission Types and "Vector Slip Failures" which deposit characters in a different universe than the one they intended to visit. "The layout of the adventure parts is pretty great; lots of nice structure, color maps, flowcharts, etc. There's location details, encounter tables, monsters and more... If you like Daytrippers, then without question this is a great book to get. 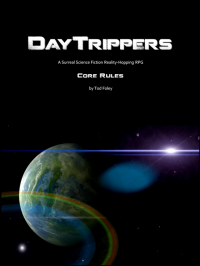 But let's say you don't give a crap about Daytrippers the RPG. In that case, this might still be a great book to get. That's because of the stories included here." "I can’t recommend this book any more highly. if you run DayTrippers, brilliant! If you do not but you do run a sci-fi exploration game – get it. Get it now."